Explanation: Normally faint and elusive, the Jellyfish Nebula is caught in this alluring, false-color, telescopic view. Flanked by two bright stars, Mu and Eta Geminorum, at the foot of a celestial twin, the Jellyfish Nebula is the brighter arcing ridge of emission with dangling tentacles below and right of center. In fact, the cosmic jellyfish is seen to be part of bubble-shaped supernova remnant IC 443, the expanding debris cloud from a massive star that exploded. Light from the explosion first reached planet Earth over 30,000 years ago. Like its cousin in astrophysical waters the Crab Nebula supernova remnant, IC 443 is known to harbor a neutron star, the remnant of the collapsed stellar core. Emission nebula Sharpless 249 fills the field at the upper left. 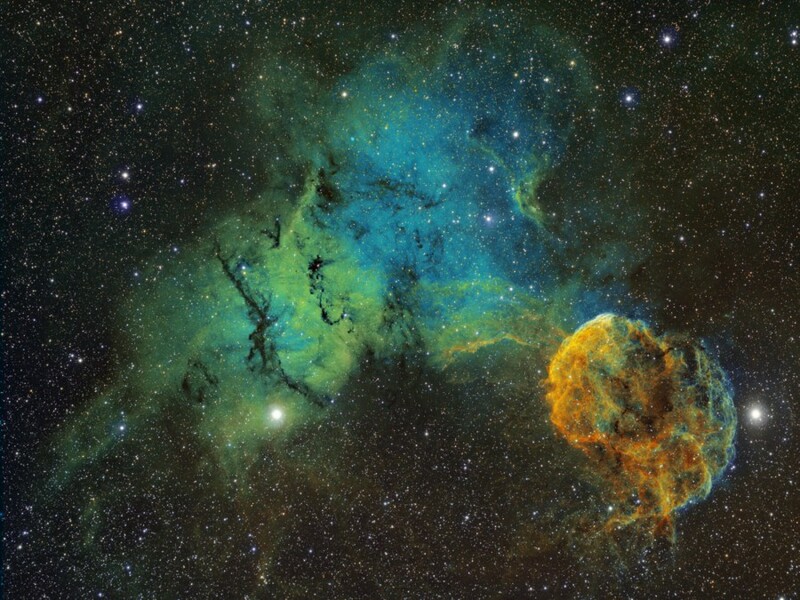 The Jellyfish Nebula is about 5,000 light-years away. At that distance, this image would be about 300 light-years across. The color scheme used in the narrowband composite was made popular in Hubble Space Telescope images, mapping emission from oxygen, hydrogen, and sulfur atoms to blue, green and red colors.